HISTORICAL PERSPECTIVE OF TELECOMMUNICATION AND BROADCASTING IN NIGERIA. Telecommunication is the transmission of information, over significant distances to communicate. 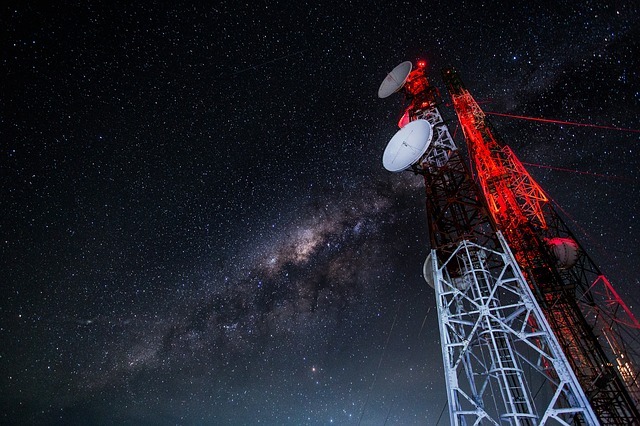 It makes use of electrical devices such as telephones and telegraphs, the use of radio and microwave communications, as well as fiber optics and their associated electronics, plus use of the broadcasting satellites and the internet. The original term broadcast referred to the literal sowing of seeds on farms by scattering them over a wide field.1 It was first adopted by early radio engineers from the Midwestern United States to refer to the analogous dissemination of radio signals. Broadcasting is the business of making and sending out radio and television programmes. In order to carry out the business of broadcasting and telecommunication it is imperative to obtain a license from the authorities. According to the Black’s law dictionary3 a license is permission, usually revocable, to commit some act that would otherwise be unlawful. A certificate or document evidencing such permission is always issued to the licensee. These authorities are the Nigerian Broadcasting commission established in 1992 and the Nigerian communication commission established by decree number 75 by the Federal Military Government of Nigeria on 24th of November 1992. Telecommunications actually started in 1886 in Nigeria because of the need of the colonial government to connect with other colonial administration in Ghana, Sierra Leone, Gambia and England .By 1893 colonial offices in Lagos, Jebba and Ilorin were provided with telephone services. Gradually a national telecommunication network was emerging. It was in 1923 that the first commercial telephone service between the towns of the Itu and Calabar was established. Between 1946 and 1952, a three channel line carrier system was commissioned between Lagos and Ibadan and was extended to Oshogbo, Kaduna, Kano, Benin and Enugu; this connected the colonial office in London with Lagos likewise the commercial centres in the country with local authority offices. The need of the telephony system in the colonial Nigeria then led to the 1955-622 development programme. It provided for the expansion of the trunk using a VHF multichannel radio system on a nationwide basis and a short microwave link between Lagos and Ibadan. After the independence of 1960, there was a need for the expansion of the network to meet the needs of the fledging commercial and industrial growth of the young nation. This led to the establishment of Nigeria External Telecommunications (NET) Limited which was responsible for the external telecommunication services. The Department of posts and telecommunication was in charge of internal network. It may be of interest to know that telecommunications was always an item in each of the development plan of Nigeria. However both parastatals were merged in 1985 to form Nigerian Telecommunications Ltd. (NITEL), a limited Liability company which administered both the internal and external telecommunications services in Nigeria. NITEL is currently under privatization. Nigeria first effort at broadcasting was in October 21, 1959 when the Western Nigeria Television (WNTV) was established. However, in 1976 the Nigerian Television Authority(NTA) was created by the then Administration of General Yakubu Gowon to consolidate all the televisions above under it control. NTA was made a monopoly. This was backed by Decree No.24 of 977 with effect from 1976. During the successful transmission to Civilian Government, 1979 constitution empowered the president to grant license state government, organization and individuals to operate television status, hence revering to the previous situation. The very first leap at regulating broadcasting in Nigeria was in 1992. The then military administration promulgated Decree 38 of 1992 as amended by Decree 55 of 1999. This Decree established the Nigerian Broadcasting commission to among other things regulate, monitor and control Broadcasting in Nigeria. It is also responsible for the establishment of all broadcast outfits in the city 2. It has 7 zonal offices inclusive of the headquarters at Abuja. To regulate Telecommunications in the Country the then Decree No. 75 of 1992 was promulgated now known as the Nigerian communication commission Act, LFN 2009. The Decree created the Nigerian communication which was first inaugurated in 1995. The commission is to regulate, monitor and control telecommunications in Nigeria. It is also empowered to issue licenses to telecommunication providers. The first licenses round was in 2002. It has issued over 200 licenses to different companies to date. The commission is saddled with the responsibility of recommending applications through the minister of information and culture to the president, further grant of radio and television licenses. The broadcasting license in Nigeria is granted by the Nigerian broadcasting commission. The broadcasting licenses are Radio station, cable television and television license. 1. Television Journal, Ending December, 1982, pp. 4-4, Egbon. M.I (1981), “origin and Development of Television Broadcasting in Nigeria. 27 – 28. 2. Best, C. (1996) press Development in Nigeria, a comparative Analysis. Midland press limited, Jos. (i) The company seeking any license must be duly registered under companies and allied matters Act2. (ii) If not a company so registered any stations established and operated by the federal, state or local government 3. (iii) Must not apply on behalf of nay foreign interest 4. (iv) Such a body must undertake to comply with the objectives of the National Mass Communication policy as applicable t broadcasting generally 5. (v) Must give an undertaking that national interest unity and cohesion will be upheld. And that any broadcast shall not offend the religious sensibilities or promote ethnicity sectionalism, hatred and disaffection among Nigerians6. However, fulfilment of the condition precedent does not guarantee automatic licenses as grant are subject to the availability of broadcast frequencies.7 Where there are broadcast frequencies on compliance with the conditions above the license shall not be unreasonable withheld.8 This entails vigilance on the part of the applicant. 1. S. 2 (1) C, NBC Act, LFN 2004. 2. S.9 Nigerian Broadcasting commission Act, Laws of the Federation of Nigeria (LFN) 2004. 1.2 PROCEDURE FOR GRANT OF BROADCASTING LICENCES. i. An application for licence addressed to the Director General of the commission. ii. Purchase an application form from any Nigerian Broadcasting Commission (NBC) office in any of its office in Abuja H.Q, Lagos, Kano, Benin, Umuahia, Maiduguri, and Jos. On payment, the form together with the Nigerian Broadcasting commission (NBC) code and the Acts is issued to you. The code and Act is needed to complete the feeling of the form. iii. The form above should be accompanied by a detailed feasibility study on the viability of the proposed station on return. iv. An affidavit by the company Directors stating that the proposed station will comply with the national mass communication policy and that the station will not broadcast any information targeted in causing disaffection among the Nigeria populace. v. Pay the relevant processing fees for each licence sought. On compliances with these procedures the licences can be issued by the president. This however is discretionary. 1.3 REFUSAL TO GRANT A BROADCAST LICENCE. As had been said earlier the Act1 makes it very discretionary for the commission to grant licences even when the condition precedent and procedure for the grant is strictly adhered to. However the commission rarely refuses to grant licence to an applicant who has fulfilled the condition precedent except where there is an anomaly. (b) Where a person is found out to have controlling shares in more than two of each of the broadcast sectors of transmission3. In determining what the controlling interest is the commission will take into consideration the structure of shareholding in the broadcasting organisation4 and the number of shareholding in other media establishments. All licence must be subject to terms and condition of the commission. Broadcast licence is to be renewed after 5 years in the first instance.8 Application for the renewal must be made six months before the expiration of the licence. In granting a new licence the commission is to review the past conduct of the licensee9. This conduct is to be glean from the past performance of the station10. Where is not in the national or public interest to grant licence such licence will not be up for renewal. The commission is empowered to revoke any broadcast licence that have failed to comply with any of its condition spelt out in S.9 of the NBC Act. iii. Where the commission finds not that the licence was granted by mistake to a religious or a political party. These parties are barred from being issued a broadcast licence in S. 10 of the Act. All other reason given for the review of the licence and revocation is based on total disregard of the Act and rules and regulations set by the commission. It is to be said here that though the Nigerian Broadcasting commission has been granted wide powers such powers is to be exercise judiciously and judicially. The commission is made up of eleven members including the chairman and exclusive of the Director General.2 Before anybody can be appointed into the board of the commission such a person must be a Nigerian3 and are to be part time members4. The Director-General shall be head of the secretariat overseeing all work of the commission. Members are to be appointed by the president on the recommendation of Minister of information, and National Orientation5. They are to hold office for three years6. Any members may cease to be a member of the commission if he resigns, dies or his tenure of office expires7. The commission is granted wide powers over anything broadcasting in the country8and are to produce and review the national broadcasting from time to time. Dispute resolution in the industry is by intervention of the National Broadcasting Commission. This intervention shall be in the form of arbitration9. This however would only be tenable where conflict arises between a licensed Broadcast company and customers likewise between a licenced broadcasting company and another. 1. S.1 of the Nigerian Broadcasting Commission Act, 1992. 9. S.2 (9) NBC Act. It will not suffice where the conflict is between the commission itself and licenced operator or any person or bodies in conflict with the commission. The proper avenue for such dispute resolution will be the Federal High Court. Anything outside this view would not amount to fair hearing as you cannot be a judge in your own cause. This principle is provided for in the chapter IV of the constitution of the Federal Republic of Nigeria 1999. LEGAL ASPECTS OF LICENCING TELECOMMUNICATIONS IN NIGERIA. The body is chaired by the minister of communications2 and eight other members who shall be representative of the Ministry of communication3, Aviation4, Transport5, Science and Technology6, Nigerian Broadcasting Commission7 and two representatives from the Nigerian Communication Commission8. A representative of the security agencies of the Federal Republic of Nigeria9. (i) Advice the minister in the representation of Nigeria at International and regional spectrum allocation bodies like the international Telecommunications union. (ii) Advice and assistance to the minister on the preparation and negotiation of Bilateral (BIT) and Multilateral (MIT) spectrum allocation treaties with other sovereign administration or other functions. check S.28 of the Nigerian communication Act, 2003. The council can form committees to enhance expertise in taking decisions but such decision must be adopted by the council before it becomes binding.10 The Council secretariat is to be staffed and equipped by the civil servants in the Federal ministry of communication. This body was established in July, 2003 by the Nigerian communication Act, 2003.12 it has all incidence of a company incorporated under the corporate and Allied matters Act, Laws of the Federation of Nigerian 2004.13 in other words it can sue and be sued, a body corporate with perpetual succession and a common seal and acquire and deal with property as it deems fit. However such dealings must align with the functions the commission is empowered to perform. The body is charged to regulate all aspect of communications in Nigeria. See S.4 of the Act. 11. S.30 (1) a & b Nigeria Communication Act. 12. S.3 (1) Nigeria Communication Act. 13. S.s (2) a, b & c, Nigeria Communication Act. iv. 5 non- executive Commissioners. Before any person can be appointed a member of the governing board such a person must be a Nigerian, of sound mind, not convicted of any crime, and not bankrupt. He must also have a considerable experience in any of these fields namely finance or accounting, law, consumer affairs, telecommunication, engineering, information technology, engineering in any field, economic and public administration.15 each are to serve 5 years term and is renewable for another term of 5years16 for more information read the Act. The conditions are not actually specified but the commission is given wide powers to make guidelines in the form of declarations spelling out the conditions, terms and benefits of any given licence.17 However before such guidelines can be valid it must be registered and the Licensee’s must be noticed18. (c) Quality of service Regulations, 2007. (g) Regulations for the Registration of Telephones Subscribers etc. The conditions in the guidelines and Regulations are subject to the type and nature of the licence. Most of the guidelines and regulations confirm with the national policy on Telecommunication. 14. S. 5(1)(3), NCA, LFN 2007. 15. S. 7, NCA, LFN 2007. 16. S. 8, NCA, LFN 2007. 17. S. 34, NCA, LFN 2007. 18. S. 36, NCA, LFN 2007. There are two classes of licence namely individual and class licence. The Nigerian communication commission is empowered by the Act to issue regulations spelling out the procedure for the grant of licence. This requirements and procedures are spelt out below. See S. 33 of the NCA. i. Register a company under the corporate and Allied matters act, laws of the Federation of Nigeria, and include as its object of business telecommunications. ii. Obtain Application form for each license required at the cost of N1, 000.00 only payable in bank draft, to the Nigerian communication commission. iii. Complete the Original application form and produce copies (as applicable). b. Certified True Copy of Article and memorandum of Association. d. Feasibility reports on the proposed service where applicable. v. Pay a non-refundable administrative fee, which is 5% of the relevant licence fee. It is payable in Bank Draft on submission of the application. Any application may pass through any of the following phase. Where the criteria above has been met the licence will be granted and Registered in the Register of individual licence or Register of Class Licence. The only licence subject to surrender, Revocation and suspension is the individual licence. The class licence can only be deregistered. An holder of individual licence may by a written notice surrender his licence at any time and such surrender will take effect on the date of submission of the individual licences and written notice to the commission19. i. Failure to pay the licence fee. ii. Failure to comply with the terms and conditions of the individual licence. iii. Failure to comply with any other law relevant to the communications industry. iv. The licence has failed to comply with any instrument made by the commission such as guidelines, regulations and declarations. v. Where the licensee has become bankrupt, entered into receivership or liquidation or entered into any scheme of arrangement or compromise all under the company and Allied Matters Act. Any suspension or revocation will take legal effect only if the licensee has been given a written Notice within 60 days and state in the notice that such breach be rectified and the licensee fails to rectify such breach. The licensee would then make a written submission to the commission. Id after due consideration the commission is not satisfied, the commission will then issue a declaration of suspension and revocation on the licence21. The commission would then communicate to the licensee the duration of the suspension and penalties to be paid. Revocation would amount to withdrawal hence the licence would be wound-up eventually22. The licence would then be deregistered from the Register of individual licence. 21. S. 45 (2) (5) & (6), NCA. The commission is empowered to maintain and create a Register in electronic form or otherwise. This Register is for the purpose of registering information such as licences, declarations, agreements, regulations etc. The content of this register is available for inspection at a fee 23. No society can downplay the impact and influence of Broadcasting and telecommunications. The change is fosters and the understanding it creates. It becomes imperative for government of any given nation to take a deep interest in it and make policy that will encourage it growth thereof. This policy can be seen in the laws made and institutions it creates. These institutions created by laws have made significant consideration to the growth of telecommunication and broadcasting. Is it in regulating the activities of the parties or in granting licence or the money it makes or in dispute resolution between the operators and consumers. The benefit is endless. The summary is that nobody can operate broadcasting and telecommunications in Nigeria without being authorize to do so through a licence. The commission; it means either the Nigerian Communication Commission or Nigerian Broadcasting Commission.